As a full-time communication professional since 1997–keynote speaker, communication consultant, speech coach, and video trainer–I have sought opportunities to meet and learn from internationally known experts. Yesterday brought a true highlight among my connections with real pros. I enjoyed meeting with 40-year veteran sportscaster Bob Neal, based in Atlanta yet familiar to viewers and listeners worldwide. I had watched Bob Neal for years on “the tube.” Now I welcomed him to the lunch table for what turned out to be a three hour action-packed conversation. We reviewed his career, and compared out communication activities and interests. In person, Bob Neal is every bit as affable and personable as he appears on your TV screen. When the dining club’s host greeted Bob and said he had watched Bob many times and admired his work, Bob responded most appreciatively. 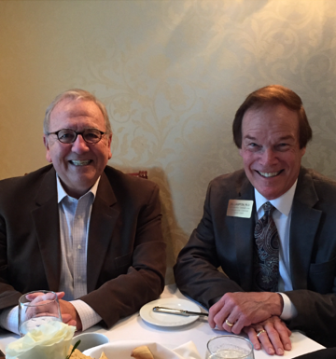 As we dined, Bob told me–quite enthusiastically–about his upcoming “Introduction to Sportscasting” evening class he will direct, scheduled for April 22. His presentation will cover all the major aspects of sportscasting. I encourage you to read the description, and then register to learn from this renowned sportscaster, winner of the coveted 2012 Lindsay Nelson Award. Here’s the information about the class, and directions for registering. Bob and I will welcome your comments. Go to the end of the blog entry in the section below and click NO COMMENTS if none have been made, or if comments have been made click 1 comment, 2 comments, or whatever the comments button says. The comments section will appear. Great Things Happening on The RichLife Show! Invitation to the RichLife Show from Bill Lampton, Ph.D. on Vimeo.